Cosatto Wow Suitable from birth! Provides you a helping hand when you are occupied with your child. According to the aspirations of our customers we delivered the ultra deluxe pushchair with all desired comforts to make life comfortable. This 3in1 Combination Pushchair consistets of Chassis, Seat unit, Carrycot and car seat adaptors. 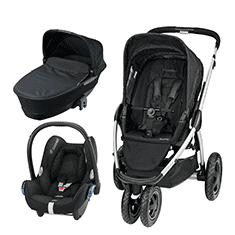 With this 3in1 combination there is no need to purchase an aditional pram or carrycot. The package also includes Port 0+ adaptors. Wow is also compatible with car seats from other leading brands with the use of multi car seat adaptor. (Available separatly). The Wow pushchair has a user friendly Gliding Telescopic Leatherette Handle to achieve compact fold. That makes it SLEEK SYSTEM! What’s with Wow?Wow’s the from-birth 3 in 1. Built by Cosatto – and parents. It includes chassis, carrycot, parent & world facing seat unit and car seat carrier. Wow that’s clever.No need to buy separate pram and pushchair with Wow - and it has Port 0+ car seat connectivity to connect up long journeys from A to B. Wow also fits car seats from other leading brands. Wow that’s smooth.Wow has the smoothest transition from pushchair to pram yet. Plus with the gliding telescopic leatherette handle to the smooth compact fold, Wow’s one sleek system. Wow that’s handy.From the one-handed seat recline and one-hand adjustable calf support to the super-sized basket with handy hideaway pouch, Wow’s stacked with on-the-go solutions. From the structured hood with extendable sun visor to fresh air panel and raincover, Wow makes your life a breeze. Wow that’s luxury.Wow’s crafted for comfort. With the deep seat, exquisite tailoring and upholstery in the finest woven fabrics, every stitch is carefully considered. Wow’s exquisite because your baby is. Port is suitable from birth to 13kg (12-15 months approx). Rearward facing, it fits with standard 3 point in-car seatbelts. The deep comfortable shell and side impact protection bring extra in-car security. It has a height adjustable headrest to suit your growing baby. Snug accessories are included. The pop-off washable fabric covers keep Port pristine. Add the Cosatto Port ISOFIX base for extra convenience and stability. Port comes with an industry-leading 4 Year Guarantee for your peace of mind. Suitable from birth to 13kg (12-15 months approx). Rearward facing. Fits with standard 3 point in-car seatbelts. Add the Cosatto Port ISOFIX base for click ‘n’ go security. Deep comfortable shell and side impact protection for in-car security. Snug accessories included. Pop-off washable fabric covers keep Port pristine. Height adjustable headrest to suit your growing baby. Port docks smoothly on to assorted Cosatto prams and pushchairs.